Eating avocados is just one of the many things they do better than us in South Asia. Never will you see a thin smear of avocado hidden beneath a few layers of cheap ham. Instead an avocado is a decadent dessert. In the Philippines it’s common to slice one in half after dinner and fill the hole left by the seed with condensed milk. Simple, sweet and rich – this combo is made even better when blended with ice and poured into styrofoam, as is done on the streets of Vietnam, Thailand and Bankstown. An avocado shake is one of the smoothie options available at Nhu Y Juice Bar but if half a litre of thick green caramel seems a bit much, maybe selecting four different fruits to be buzzed until they become a fun shade of browny pink is more appealing? My go-to fruit combo is strawberries, rockmelon, lychees and pineapple, and you’ll be pleased to see that there’s no kale in the mix. 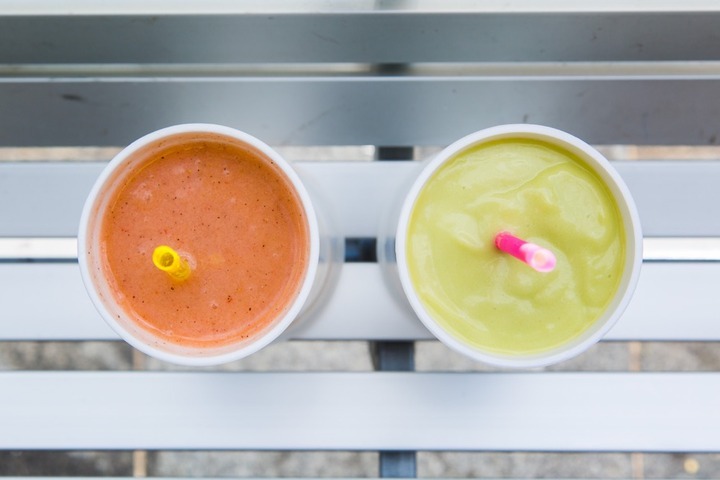 They keep smoothies fun at Nhu Y.